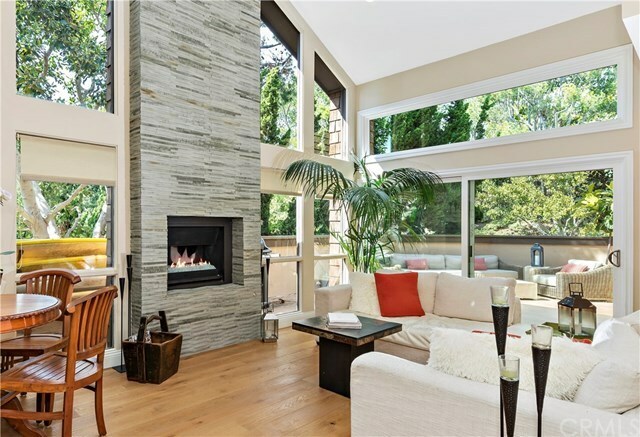 This beautifully designed Big Canyon home with soaring ceilings, walls of windows and amazing natural light, set the tone for the sophisticated but casual vibe. Designed for entertaining, this home offers an incredible open-living concept centered around the stunning Island Stone fireplace. Entertain with ease in the chef-worthy kitchen with quartz countertops, glass tile backsplash and stainless-steel appliances, including a Thermador refrigerator with French door. The beautiful new island utilizes the same meticulous materials and finishes that you will find throughout. Enjoy the luxurious master bath with a spa-inspired ambiance; featuring a concrete countertop w/integral dual sinks, custom cabinetry, seamless glass barn door and Hansgrohe fixtures. Designer details throughout, include European wire-brushed solid oak floors, recessed LED lighting, built-in closet organizers, custom blinds, solid core panel doors and hardware. The oversize patio updated with hand-brushed concrete is a phenomenal outdoor living space. Enjoy this serene retreat just minutes from the beach, restaurants and world-class shopping in the heart of Newport Beach. This home is perfect for lock-and-go vacation home buyers or anyone looking for a fabulous primary residence! Community amenities include, gated entry, pool, spa and tennis court.